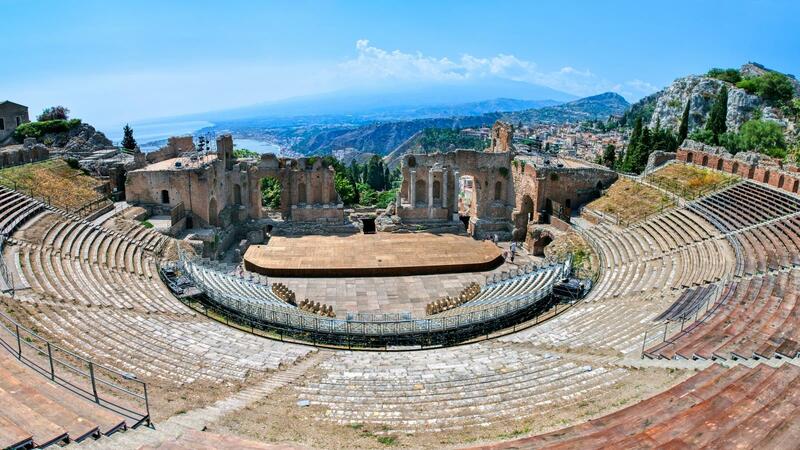 Taormina is one of the most popular holiday destinations in Sicily. Thanks to its exposed location on a rocky terrace, you will have fantastic views of the surrounding coastline and Mount Etna in the picturesque old town of Taormina. Taormina,‭ ‬one of the most desirable‭ ‬places to visit for tourists in Sicily.‭ ‬Every year millions of visitors choose it for its beauty,‭ ‬its‭ ‬unique‭ ‬position,‭ ‬its‭ ‬blue‭ ‬sea and its art. Meeting at 19.30 with the licensed Local Guide to begin your 1.5-hour Taormina Walking Tour. Your guide will greet you before leading you toward Palazzo Corvaja, an atmospheric public square. Then pass by the Odeon, a small Roman theater built in the 2nd century but not re-discovered until 1892. Your guide will explain this theater’s history as you marvel at the ancient remains. Continue through the heart of Taormina, where you’ll enjoy the essence of beautiful Old Town. This part of the city, most alive at night, will engage all of your senses. Stroll along colorful streets lined with flowers and lemon and olive groves, smell the aromas emanating from the traditional Sicilian restaurants, and listen to the music of the live performers, before visiting the Public Garden. Stop at Belvedere Square along the main street, Corso Umberto, to enjoy the wonderful view of the picturesque coast and the skyline dominated by powerful Mt Etna. As you walk, your guide will reveal Taormina’s culture, architecture and natural and political history and tell stories about the Sicilian people and their traditions. Conquered by the Romans, Greeks, Arabs, Byzantines and Normans, Taormina boasts a rich and fascinating history and a robust mix of styles. After passing in front of the San Domenico cloister, which has been transformed into a beautiful 5-star hotel, turn your mind back to medieval times as you wander the Jewish quarter and visit important monuments and areas such as Palazzo Duchi di Santo Stefano, Porta Catania, Del Carmine Church and the Duomo Stairs. Your tour ends in Piazza Duomo, where your guide will leave you with an anecdote on the symbol of Taormina. This is the perfect place to continue your night out in Taormina! Persons: Tour guaranteed with 4 participants only and with a maximum of 15 passengers.